Did you know … there are over 2,000 different freestanding bathtub models flooding the market today, but only a handful that actually deserves a 4-star rating, or better? Buyers’ Guide: What exactly is a freestanding bathtub? 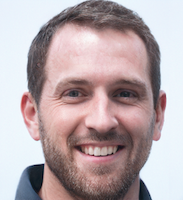 What does freestanding mean? 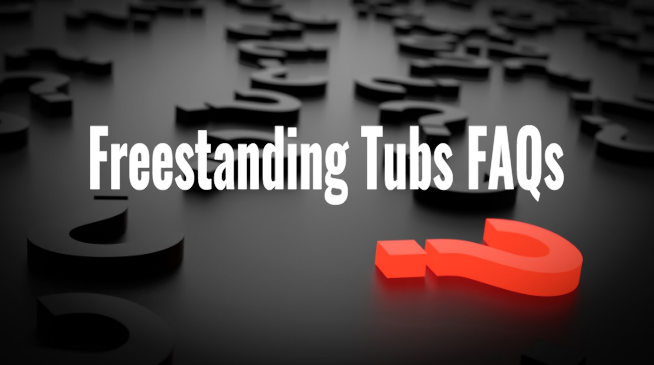 With so many freestanding tub models floating around the web, picking the best one can be a tough task without the proper resources, and guidance. For that reason, after using our 14-point rating system (which includes a wide range of factors like durability, reliability, price, and more) the team at Showersly was able to narrow down the field to our TOP 11. After months of testing, these are the best freestanding tubs that 2019 has to offer. Hope you enjoy. Includes 14 multi-directional whirlpool jets, a waterfall faucet, handshower, and touch screen keypad, to create 2019's #1 rated freestanding tub. A 20 jet system - with 10 water jets, and 10 air bubble jets, combine to provide a wonderfully relaxing soak, and at a price that can't be beaten. A beautiful brushed nickel tub filler accompanies this highly-rated free standing bathtub, along with a stylish handshower. Crafted from high-gloss acrylic-capped ABS with fiberglass reinforcement, this free standing tub sports a Limited Lifetime Warranty. This high-backed, ergonomically shaped tub, provides excellent comfort, and the ability to custom fit a tub filler of your choosing. Beautifully shaped, this freestanding tub comes in 3 awesome sizes: 59 inches, 68 inches, and 71 inches. This AKDY F277 is mega cheap. If you need a budget-friendly tub for a spare bathroom, this one is a winner. This double-backed tub, is perfect for 2, and holds over 95 gallons of water, for a true full-body soak. At 62.9 inches long, the Aurora from Ariel Platinum, is an excellent option for smaller spaces. Crafted from pure solid copper, and finished by hand, the Sinkology TBT-6631CL is straight out of a dream, for the "uber-creative" bathroom designer. Handmade, 100% recyclable, and made of 99.7% pure recycled copper, this Japanese Copper Stand Alone Tub is environmentally friendly, and stylish. 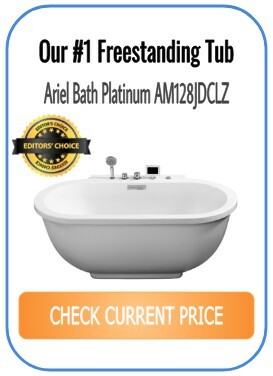 Starting off my list of the 11 best freestanding tubs of 2019 is my #1 rated – Ariel Bath Platinum AM128JDCLZ in glossy white. If you’re looking for a top-rated freestanding tub that comes with an integrated hydrotherapy system, the Ariel Bath Platinum is a fantastic option. Unlike most freestanding bath models on the market, the Ariel Bath Platinum also comes with a hand shower. This is extremely convenient for helping with tasks like – keeping your tub clean, bathing your children, or washing your pets. 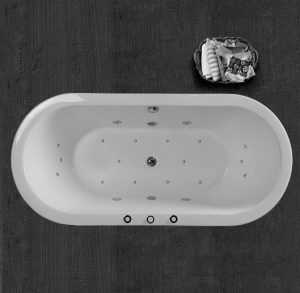 Also, with dimensions at 71″ X 37.4″ X 27.5″ ( L x W x H), you’ll find the Ariel is quite deep in comparison to other tubs on the market. This added depth is the key component in providing the type of immersive soak that bath enthusiasts look for and crave. The #2 best freestanding tub of 2019, is the Woodbridge B-0030 Jetted Stand Alone Bath. If you’re looking for the best value freestanding bath for your bathroom, the Woodbridge B-0030 is my first pick. This Woodbridge bath has 10 whirlpool bubble bath jets, and 10 adjustable body massage jets. That makes for 20 total jets, designed to hit every inch of your aching body, after a long day. You know that one spot on your lower back that has really been killing you? I can’t be the only one. Or maybe your neck and shoulders get stiff from time to time? With the Woodbridge B-0300, simply let its hydrotherapy system do the work, and enjoy a nice relaxing soak while its adjustable jets laser in of focus areas, improving circulation. I also loved this bath’s underwater mood lamp. If you’re looking to up the relaxation another notch, and give your bath an extra special feel to it, these lights do an excellent job. At #3 on my list of the best freestanding tubs of 2019, is the Woodbridge B-0012 Witch Faucet II. If you’re looking for the best-rated stand alone bath with a shower on the market, look no further than this beauty. Right off the bat with this free-standing soaking tub you’ll notice it’s a sleek, simple, and elegant shape. The Woodbridge B-0012’s beautiful glossy white shape, combined with the stylish faucet, and handheld shower, combine to create a free-standing bath that deserves to be on your radar. You’ll also notice the Woodbridge comes with a brushed nickel overflow and pop up drain, this is especially helpful for those times where you’re filling up your bath water to the perfect temperature, lose track of time (sometimes fall asleep), and awake to a fun water surprise in your bathroom (aka: flooded floors … no fun). 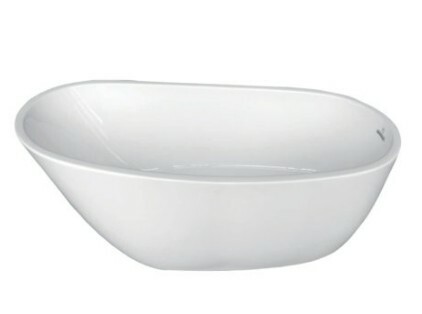 Lastly, and important to mention this soaking tub from Woodbridge is designed with ergonomics in mind. So what does that mean? So basically, this soaking tub from Woodbridge earns 5/5 stars in our book, in terms of how comfortable it is when compared to other models on the market. At #4 on my list of the best freestanding tubs, is one of our best acrylic freestanding tubs, the American Standard Cadet. At first glance, you’ll notice this bathtub’s clean looking glossy white acrylic-capped ABS (Acrylonitrile Butadiene Styrene), that’s reinforced with fiberglass. You’re probably wondering what ABS means, I’ll explain. In essence, ABS means the bathtub has high rigidity and high impact strength. Also, it has excellent chemical resistance, and abrasion resistance. In simpler terms, this bathtub is made with ultra-durable premium quality acrylic. Aside from the excellent acrylic material, we also loved that this stand-alone bathtub comes handy with a stylish chrome freestanding tub filler, and a handheld spray shower. This way, you’re ahead of the game when it comes to finding a compatible tub filler with your acrylic bathtub, plus the additional hand shower is a welcomed add on. Overall, the American Standard Cadet bathtub is an excellent value and holds the title of our favorite acrylic freestanding bathtub of 2019. At #5 on my countdown of the best freestanding tubs of 2019, is the Woodbridge 59″ B-0029 (with no faucet). If you’re looking for one of the best free-standing tubs with a modern design, this glossy white Woodbridge model is a great option. First, let’s talk about something you probably noticed upon your first glance, it’s a wonderful shape. Woodbridge really hit a home run with the B-0029’s ergonomic design. Or in other words, this bathtub is super comfortable. Probably one of the most comfortable freestanding bathtubs of 2019! Also, check out the awesome brushed nickel faucet on this bathtub. This is an optional feature, but I think it goes great with this bath model. This free-standing bath is made with premium quality Acrylic, with resin and fiberglass reinforcement. So ultimately, this bathtub’s construction is lightweight, yet durable, making installation a breeze for your home (installation services offered). Coming in at #6 on my list of the best free-standing tubs of 2019, is one of the best large freestanding bathtubs, the KINGSTON BRASS VTRS592928. Right off the bat, you’ll notice that this Kingston Brass has a wonderful deep concave shape to it. The high-backed design is specially crafted with ergonomics in mind. This Kingston Brass model is made from mostly acrylic and reinforced with fiberglass. This combination enhances the bathtubs’ durability. The KINGSTON BRASS is also an incredibly spacious stand-alone bathtub. It is 68-inches long, 31-inches wide 28.5-inches tall, and it has a generous 60-gallon water capacity. When you’re at home, and you sink deep into this bathtub, with some nice warm water, and your favorite tunes playing in the background, you can’t go wrong. 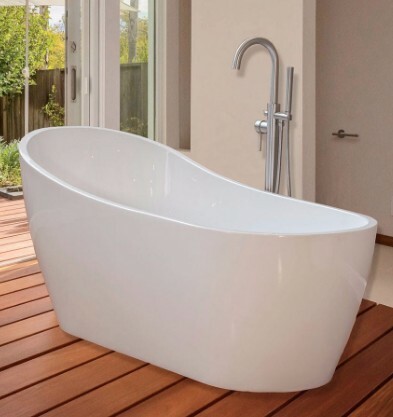 The #7 best freestanding tub of 2019, is the beautiful AKDY F277. The F277, like the AKDY AZ-F274, has a deep, modern and elegant design, resembling a concave shell that is quite tall compared to other models. The first thing to keep in mind, it has a huge gallon capacity at 95 gallons held. This depth provides the immersive soak that bath lovers know and love. Thus, the AKDY F277 is a large free-standing bathtub, when compared to the other models on our list. If you’re looking to go big, and you have space, the AKDY F277 is a great option. If you’re looking for a small free-standing tub, it’d be best to check out the other tubs on our list. This oval stand-alone bathtub is made with acrylic and includes the anti-skidding patterns (to prevent it from sliding on your floor), a drain fixture, and metal feet. Like the other AKDY model of our list, the drain includes a flexible pipe, which is quite useful to install this versatile bathtub anywhere with no concerns about the drain. If you’re looking for a more budget-friendly free standing bath for your bathroom, the AKDY F277 is a fantastic option. At #8 on our list of the best freestanding bathtubs on the market, is the AKDY AZ-F274. AKDY produces a lot of famous showers in the market, and their tub game is no different. When constructing their free-standing baths, they design with beautiful shapes in mind, without forgetting the importance of great water capacity, and high-quality materials. It’s made with fiberglass, and coated in acrylic, giving this bathtub superb strength, and durability. It should be pointed out that this bathtub is one of the larger free-standing baths on our list with its dimensions at 70-inch wide, 31.5-inch long and 28-inch tall. These free standing bathtub dimensions create a HUGE gallon capacity at 95.1 gallons held. This is good for the most gallons on my list. Also, and important to note, the bottom surface of the bathtub is made with an anti-skidding material. This means you can install this bathtub in the center of a bathroom because it doesn’t require walls, like regular drop-in-bathtubs. Another plus with the AKDY AZ-F274 is that it comes with the drain fixture. It is made with brass and finished with polished chrome. It also includes a flexible pipe that proves quite versatile upon installation. The support feet of this free-standing bathtub are both made from stainless steel and are included. If you’re looking for one of the best cheap freestanding baths, the AKDY AZ-F274 will have your friends thinking you spent thousands. 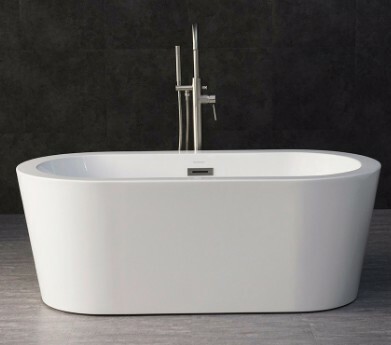 At #9, on our list of the best free-standing tubs of 2019, we have the ARIEL Platinum PS122-6330 Aurora Bathtub. ARIEL is quite known for their showers, but it’s wise not to sleep on their stand-alone tubs. You wouldn’t want to miss out. Like other bathtubs on our list, the ARIEL Platinum PS122-6330 Aurora Bathtub is constructed with acrylic. The Aurora comes with concealed foot pegs, that are discreet, and out of direct eyesight when you’re looking at your floor. Having these foot pegs allows the bath to be easily adjusted, and leveled. For the Aurora’s dimensions, it is 62.9″ long x 29.5″ width x 23.6″ height, so it is one of our smaller stand-alone soaker tubs on our list. If your bathroom is tight on space, or if you’re looking for a more traditionally shaped bathtub, this small free standing bath from Ariel is a fantastic option. At #10 on my list of the best free-standing bathtubs of the year is the Sinkology TBT-6631CL Handmade Copper Claw Foot Free Standing Bathtub. If you’re looking for this year’s best copper free-standing bathtub, this Sinkology model earns our top pick. Modern-styled bathrooms are extremely popular these days, however, this beautiful contemporary-styled bath from Sinkology gives them some worthy competition. Most of the other freestanding baths on our list sit flat on the ground, but with this freestanding pedestal bathtub, it comes with beautiful feet, so it sits well above the floor. This type of design does wonders for increasing the “space” in your bathroom. Finishing off my countdown of the best free-standing tubs that 2019 has to offer, is the Premier Copper Products BTR45DB Japanese Copper Soaking Bathtub. If you’re looking for the #1 best copper Japanese soaking bathtub for sale on the market, in 2019, look no further than Premier Copper Products’ BTR45DB Japanese Soaking Bathtub. There’s a bunch of reasons to love the design of this Japanese copper soaker bath from Premier Copper Products, but I’ll try to keep it short with my top 3. This bath is handmade. This gives your bathroom a real authentic feel to it. I love that this bathtub is made with 99.7% pure recycled copper, and is 100% recyclable. Self-explanatory, go green! If you’re looking for where to buy this bathtub, click the button below. There are several different models of bathtubs in the market these days, but the difference between them is not only about the shape, but also about how they are supposed to be implemented. So many people ask, “What does freestanding mean?” and “What exactly is a freestanding bathtub?” I’ll happily explain. Freestanding bathtubs are, as the name suggests, free from the requirement of walls or pre-projected designs to include it in the bathroom. Their design is often the most beautiful for bathtubs as the body is often designed with artistic care and can resemble sculptures. Also, their installation is versatile, as they can stand anywhere where you can connect a water pipe and a drain fixture. They’re able to be installed right in the middle of the bathroom, in the corner, or in the shower stall, pretty much wherever it’s dimensions fit. The other most commonly found bathtubs are the built-in tubs. Built-in models require a pre-existing frame, which can be quite costly to install if you don’t already have one. That’s why, if you’re looking to modernize your bathroom and replace your old bath, I recommend going with a free standing model. Flexible Installation: Non-freestanding bathtubs MUST be installed next to a wall. Freestanding baths, on the other hand, can be installed anywhere their dimensions fit, even in the middle of the bathroom if you have a drain there. The illusion of Extra Space: Installing a free-standing bathtub won’t actually give you a more spacious bathroom, but, it will feel like it! The open area underneath the bath gives the effect. Unique Style: Whether you’re looking for a modern-style tub or contemporary-style tub, freestanding models come in all shapes and sizes. This allows for more creativity and different looks when designing your bathroom. Different Materials: Stand alone baths can be made with various materials including acrylic, cast iron, copper, and more. Depending on the material, the bathtub will have different benefits. For example, a copper bath will more durable and last for decades. Shows Off Tile: Free-standing baths have smaller bases than drop-in-bathtubs, so if you’re super proud of your tile, that is a great reason to upgrade to a free standing bath. What is the best material for a freestanding tub? Other materials have their benefits as well. For example, cast-iron freestanding baths have superior heat retention, and copper freestanding baths have a unique vintage look. What size freestanding tub should I buy? The size of freestanding tub you should buy depends solely on your bathroom’s space confinements. Measure your space first, then start to select a bath. Common-sized freestanding baths are around 60” in length (5 ft.), 30” in width (2.5 ft.), and 18” in depth (1.5 ft.). Smaller-sized freestanding baths can be around 55” in length (4.58 ft.), 28” in width (2.33 ft.), and 15” in depth (1.25 ft.). How much space is needed for a freestanding tub? About 6 inches of space is needed from each end of your freestanding tub to fit properly. Any less than 6 inches and you run the risk of making your bathtub look cramped. Are freestanding tubs more expensive? Yes, freestanding tubs are usually more expensive than standard built-in tubs. This is because freestanding baths usually come in beautifully sculpted designs, which raises the price, and extra features, like hydrotherapy jets, and handheld showers, that built-in bathtubs simply won’t have. How much does it cost to install a freestanding tub? To install a freestanding tub it costs $1,000-$2,000, on average. 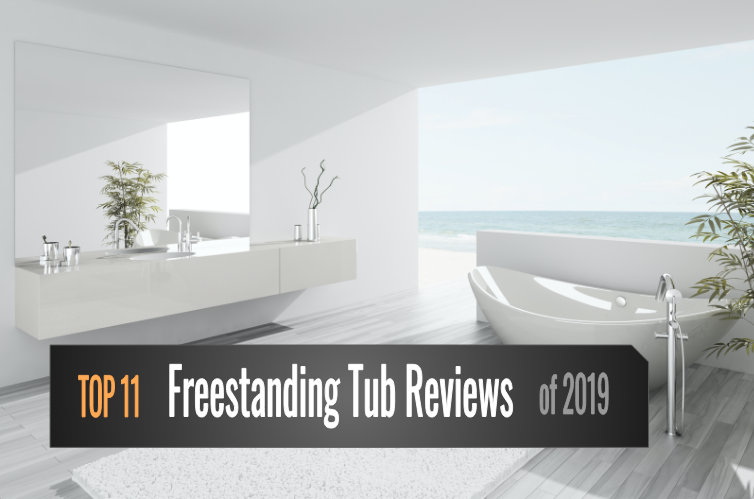 Thanks for checking out my list of the TOP 11 best freestanding tubs for bathrooms in 2019, and buyers’ guide. 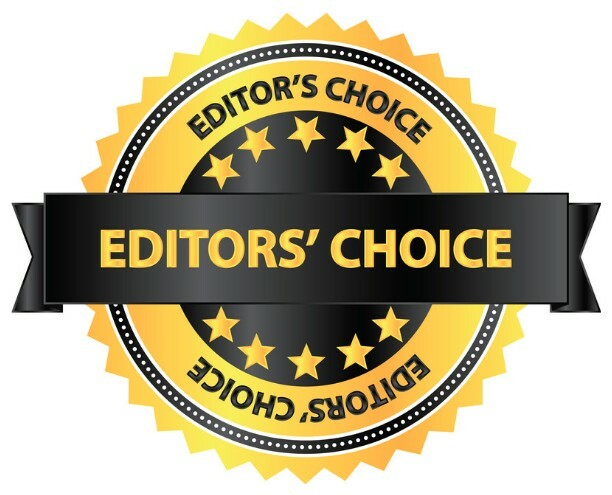 After reading my freestanding tub reviews you’re left with the cream of the crop, in terms of tubs, among thousands of models on the web, all from the most trusted manufacturers in the industry. So, if you’re looking for the top freestanding bath of the year, our #1 pick goes to the Ariel Bath Platinum AM128JDCLZ. Want more awesome bathroom stuff? Click the picture below, and take a look around.